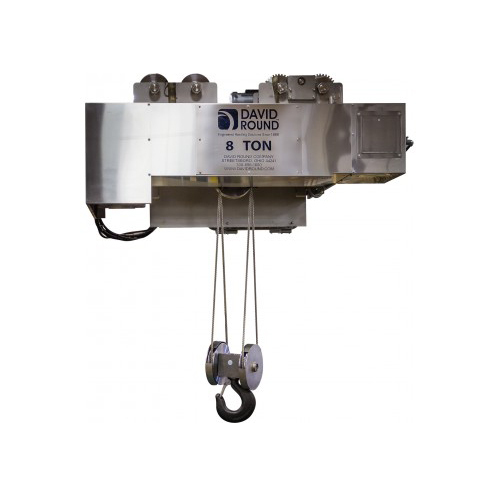 If you have a difficult lifting or material handling challenge, David Round should be your first call. Unlike many other equipment makers, we thrive on special requests. Ask us to design and build a custom engineered hoist, winch, crane or other product to your specific environment or restrictions. We also offer customization of our Ruger Industries products. Whether it is a difficult footprint, ultra low headroom or particularly nasty operating conditions, we will listen and respond with advice from well-trained engineers. David Round is a leading supplier of jib cranes, including both free standing jib crane (floor mount) and wall mounted jib crane styles. You can add a motorization kit to any of David Round’s jib cranes. For existing cranes, our Roto-Mate™ or Roto-Max™ Motorization Kits can be used to convert your equipment into safer, more ergonomic material handling device. We specialize in supplying stainless steel jib crane products, which are often found in the pharmaceutical cleanroom and food processing industries. We can quickly provide these cranes to you because these items are part of our standard offering. David Round has an in-house surface treatment facility dedicated solely to glass bead finishes for its stainless steel jib crane products. This capability provides more hygienic surfaces than available from conventional crane manufacturers. David Round can provide custom engineered jib crane products by designing them to your specific needs, including man-rated personnel lifting systems to help workers safely access hard to reach areas.